Went to work - got there on time for a change. Busy day at work - also discussed keeping a diary and how a woman's day has changed since 1891 and the things that we take for granted like doctors, telephone, computers etc. Our Internet access is down at work and until today I didn't realise how much we use it - needed it three times today and couldn't use it. Day passed quickly because we were busy, didn't get chance for a lunch break. Work at Tourist Information centre. Meet visitors from many parts of the world today ie USA, Australia, Japan, Germany etc. Give advice on local area. 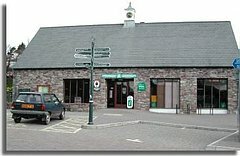 At work in National Park Information centre advising visitors on walking routes, attractions and activities in the area. Gweithiai un arall yn rheolwr technoleg gwybodaeth ir awdurdod lleol. I rushed to clock into work where the familiar routines of the morning calmed the stress of the earlier mad rush. Checked emails, browsed the Web for material for the website I manage, edited webpages, discussed perl and cgi scripts with a script expert I had never met before on the other side of the world and read minutes which would be held later via video conference between Brecon and Llandrindod Wells. Lunch at my desk. Afternoon meeting lasted almost 2 ½ hours! Back to answer more emails and then clock off!